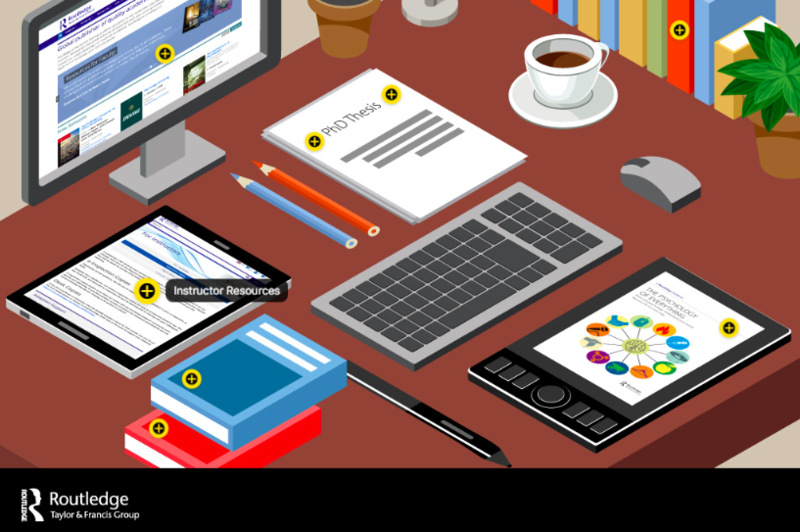 Description: Routledge uses ThingLink's new editor to create a helpful infographic for teachers to explore while chosing books to use in the classroom. The infographic is targeted at Psychology faculty and each hotspot educates on different Routledge products, using online resources, and even a free eBook download. The new editor offers many advantages over the previous ThingLink editor and you can read this post on why our team recommends switching to the new editor. 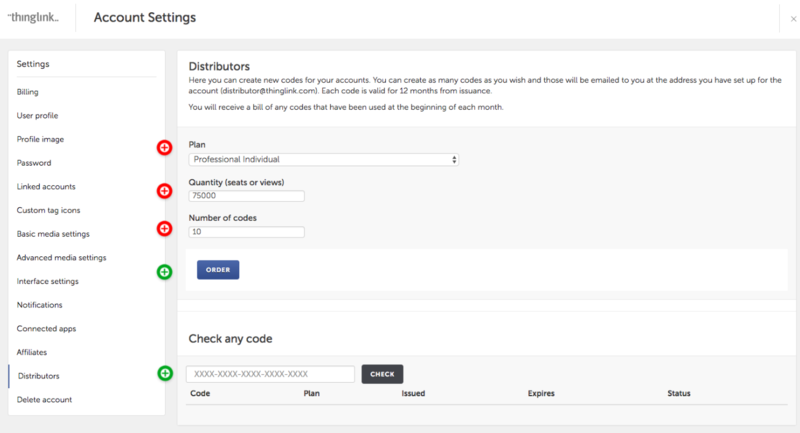 Our new distributor program offers resellers an easy way to create ThingLink accounts to customers. In this blog post you will learn how to create activation codes and instructions for clients to redeem the codes. If you have questions, or you want to become a ThingLink Distributor, please email our team at sales@thinglink.com. Once you are approved, we will schedule a demo to go over best practices and project ideas for clients. Description: Building interactive maps and floor plans with ThingLink is a popular way to educate viewers about physical spaces or administer virtual tours. For example, you can create an interactive floor plan of your corporate office to acclimate new employees before their first day, or interactive maps featuring your organization's initiatives in a certain region. 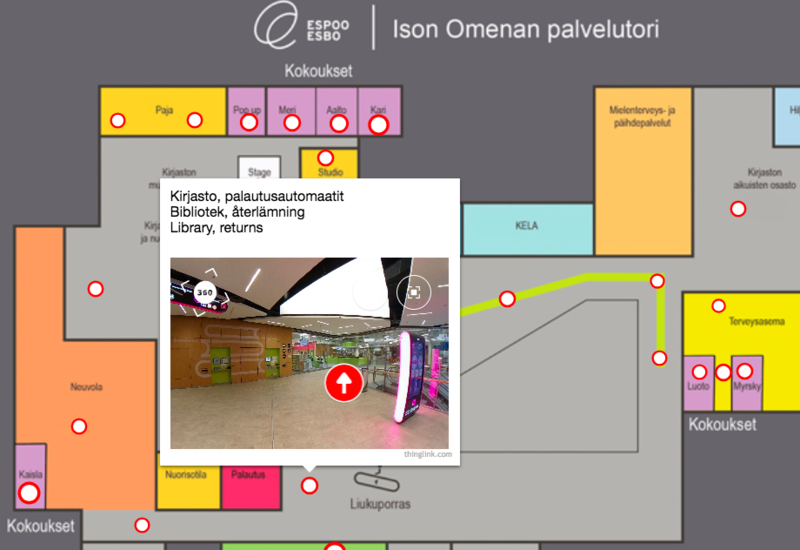 The City of Espoo, Finland layers 360° images on top of each room appearing in this floor plan of a new service center. This virtual tour gives visitors a view inside the service center and learn where a certain service is located and how to get there. If you are looking to acquire an easy to use DIY 360° camera for making interactive maps or floor plans we recommend the Ricoh Theta. Why we recommend switching to ThingLink's new unified editor! Our new interactive editor offers a wide range of enhanced features and much more flexibility than the previous editor. Note that if you change to the new editor it won't alter previously uploaded content and is only be activated for new uploads. As of today, we support four different types of media that you can make interactive: images, videos, 360 images, 360 videos. Each of these four media types will have the same exact feature set and interface once opened in the new editor. Continue reading for a summary of the main highlights and why we believe you should switch to the more powerful new editor. 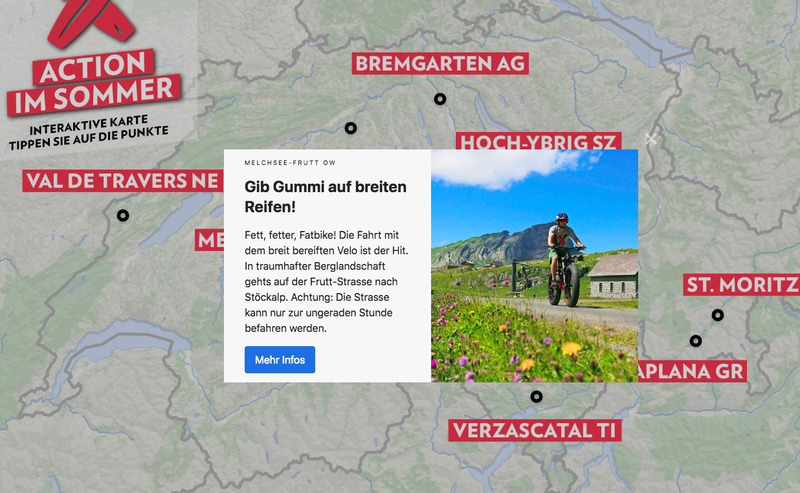 Description: Blick takes their storytelling to an entirely new level with this microsite featuring nine unique interactive maps. Using ThingLink's new image editor, each map highlights a different theme for how to spend summer holiday in Switzerland. For example, one map highlights great places to spend time with family, while other maps review the best places to eat, relax and hike. Readers can educate themselves by clicking on the hotspots to learn about each destination and click to view their website. This visual experience is very engaging for viewers and replaces long-form content that is text heavy. Have you been interested in creating interactive infographics and 360° experiences for your organization or customers, but could not yet commit to a full Premium plan? 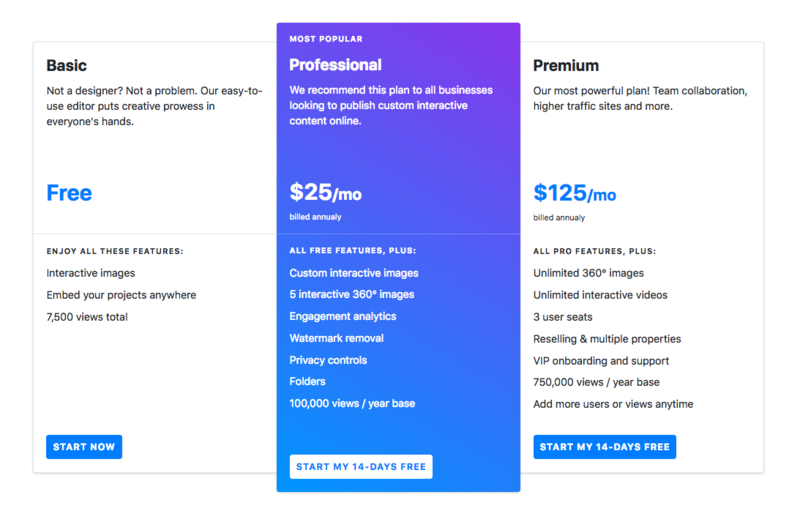 We have exciting news for you: ThingLink just launched a new Professional business plan that gives an individual content creator the most flexible and affordable way to get started with creating stunning interactive visuals! Description: River Island recently expanded into homeware and uses ThingLink interactive 360° images for digital customers to immerse themselves in the pop-up shops. Exploring the three rooms gives viewers the power chose their preferred style, as well as click on the hotspots and purchase the products they're browsing. Our new tag layouts are fully responsive on mobile and work excellent on all screen sizes. In this use case, we see the e-commerce tag in action that includes a customizable picture, product description, price, and call-to-action button. Description: Arsenal uses ThingLink to create an immersive experience for their fans to meet the players through an interactive image introduction. 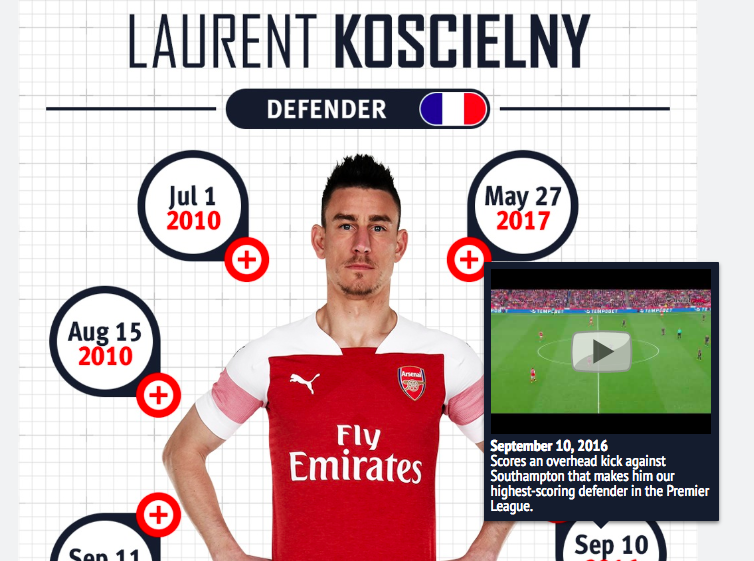 While navigating from the team news section of Arsenal's website, unique landing pages include an image for fans to hover and unlock video highlights, key stats, and quotes from each player. Using interactive images is an engaging way to educate your audience on any person or place. Project idea: simplify your team introduction landing page with an interactive image featuring your staff. This new feature gives Premium business users the ability to invite colleagues to view and create ThingLink content for easy team collaboration. Each admin user will have the ability to invite and manage users through the new "My Users" tab appearing on the top bar navigation. 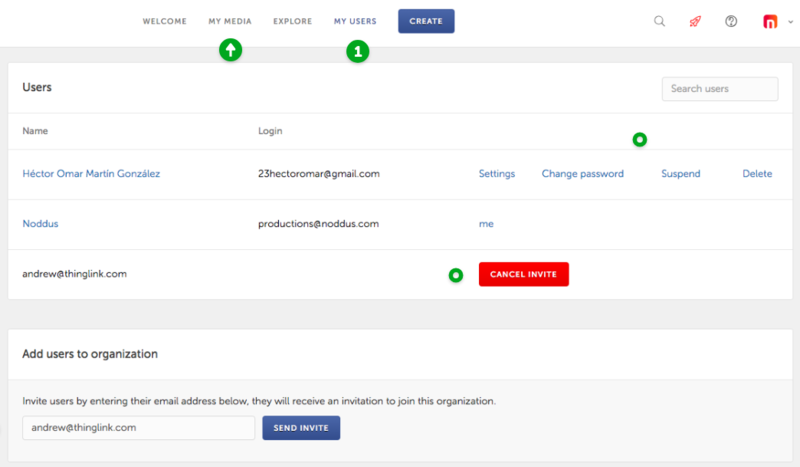 Anyone who is invited and accepts the invite will be able to create and post to shared folders that can be viewed by the entire team. Continue reading and click the green icons in the interactive images to learn how to use this new feature. If you have any questions or feedback about this new feature, feel free to email support@thinglink.com. Description: Drive Shack Orlando, an entertainment company that combines golf, competition, dining, and fun, takes customers on a walkthrough tour of their stunning entertainment complex with a ThingLink 360° experience. Visitors to the Drive Shack website can "explore the space" and learn about the various amenities and unique offerings available for their next visit by clicking the arrows to navigate. If you are a business in the entertainment industry, using a ThingLink 360° experience is an affordable, simple and innovative solution to educate and excite new customers about your destination.